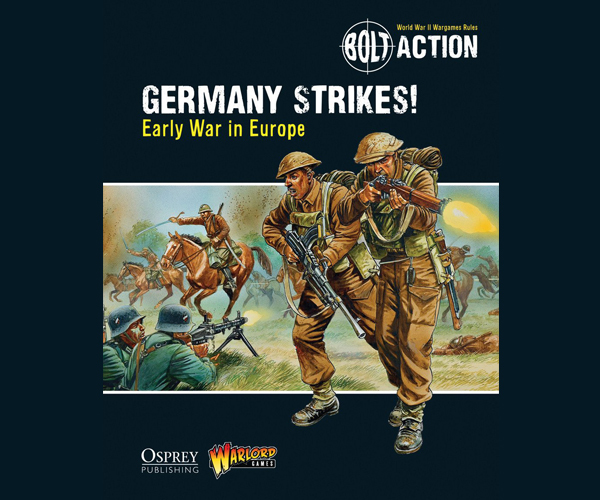 Home > Products > Books & Novels > Osprey > Bolt Action > Bolt Action: Germany Strikes! In 1939, Germany shattered the peace of Europe with a lightning-fast strike against Poland. The next year, it captured Denmark and Norway, before launching its famous Blitzkrieg against France, Belgium and The Netherlands. In less than two years of fighting, Nazi Germany became the master of mainland Europe. This new Theatre Book for Bolt Action allows players to command armies of German tanks driving across the continent or to lead the desperate defence of the outgunned Allied armies. New scenarios, special rules and units give players everything they need to recreate the devastating battles and campaigns of the early war in Europe, including the fall of Poland, the breaking of the Maginot Line and the dramatic retreat to Dunkirk.